In Paris I always eat my first and last meals at the venerable old bistro Chez Denise, also known as the Tour de Montlhéry. I’ve been eating here since 1986, when it was open 24 hours a day (it’s now open only for lunch and dinner). Located in the center of the city, in Les Halles, the place is sufficiently intimidating that, at least in this season, there are hardly any tourists (you can’t see inside, they speak no English unless pressed, and you can’t get in without a reservation, even if there are empty tables). The food, however, is wonderful—and copious! 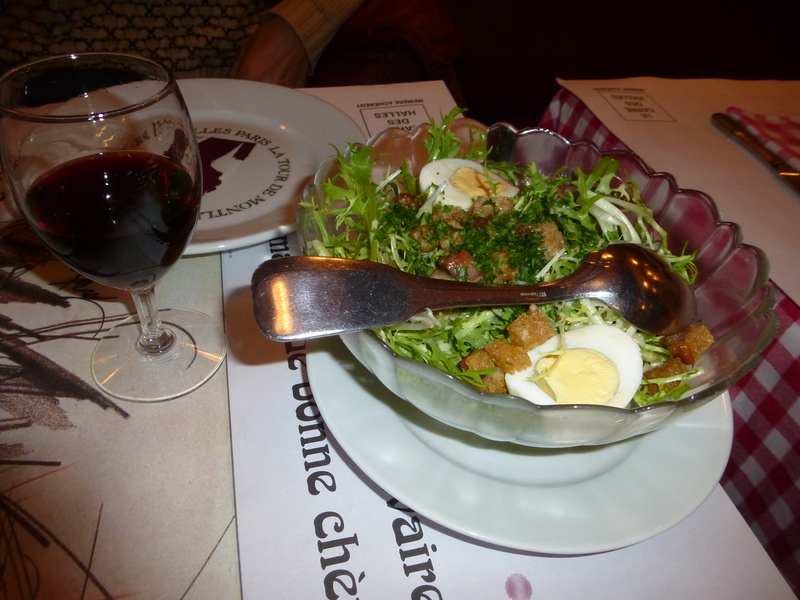 If you’ve followed my Paris travels before, you’ll be familiar with this restaurant. 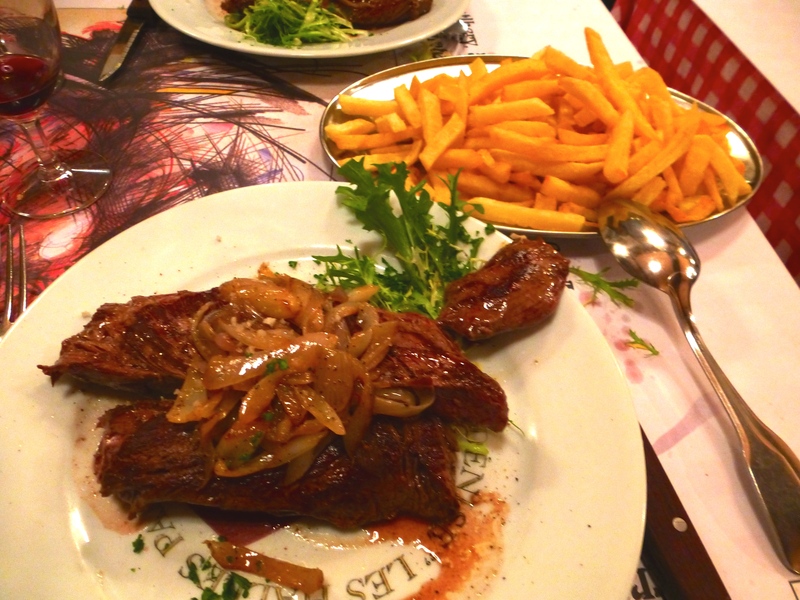 Main course: Onglet de boeuf, hanger steak smothered with shallots and served with a copious portion of french fries. I have mine cooked saignant (“bloody”: very rare). Délicieux! 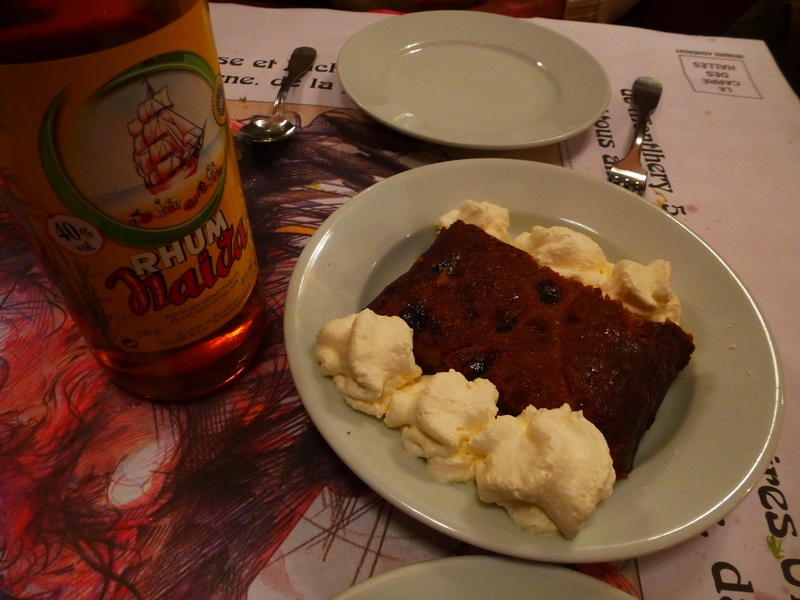 En dessert: le baba au rhum, a yeasted spongecake heavily soaked with rum and sided with ample dollops of whipped cream. They give you a bottle of rum on the side in case you want to additionally douse the cake for more inebriation. I recommend this place highly, and have sent many people here over the years (Seth Andrews recently failed to go: his loss). I always make friends here, for the tables are very close together. This time we sat next to two dignified French ladies, each of whom had a huge copper saucepan of tripe stew (they offered me some, which convinced me that I am not wrong to abjure tripe). I also met a wine writer, who gave me some valuable tips on excellent wines that aren’t expensive. Anthony Bourdain, rest his soul, also loved this place. Here’s an episode of No Reservations in which he visits Chez Denise and is impressed by the portions. Bourdain’s visit to Chez Denise (I believe he’s sitting at the same table) goes from 19:30 to 23:45. He had blanquette de veau with noodles (veal stew; good choice), probably also the Brouilly, and, of course, the baba au rhum. This entry was written by whyevolutionistrue and posted on November 6, 2018 at 9:30 am and filed under food and drink, travel, Uncategorized. Bookmark the permalink. Follow any comments here with the RSS feed for this post. Both comments and trackbacks are currently closed. The Haddock au beurre blanc seems yummy. Unfortunately I can’t get that Daily Motion hosted episode to play: “Sorry! An unexpected error has occurred” & I can’t turn up a copy at a different host site. Perhaps others will have better luck. Divinity is where food is and that food is about as close to any deity someone will get. What were the tips for selected great wine? Since 2008, I’ve been finding, in America, inexpensive wines, though not all of them, have become much better and closer, in approximation, to the expensive ones I used to drink. Agreed. I think methods are becoming standardized, which is generally a good thing. Chez Denis starts around 19:00. Well, that looks forking amazing. I miss Bourdain. There was an episode in Quebec where he dined with two gentlemen whose goal in life was for them to be ‘excellent dining companions’. Kiddo took that to heart and has tried to model the same. Chez Denise is one of our favorites. I would, however, advise also to beware of the “andouillette” if you prefer your food without the “whiff of the pipe” that comes with the tripes. 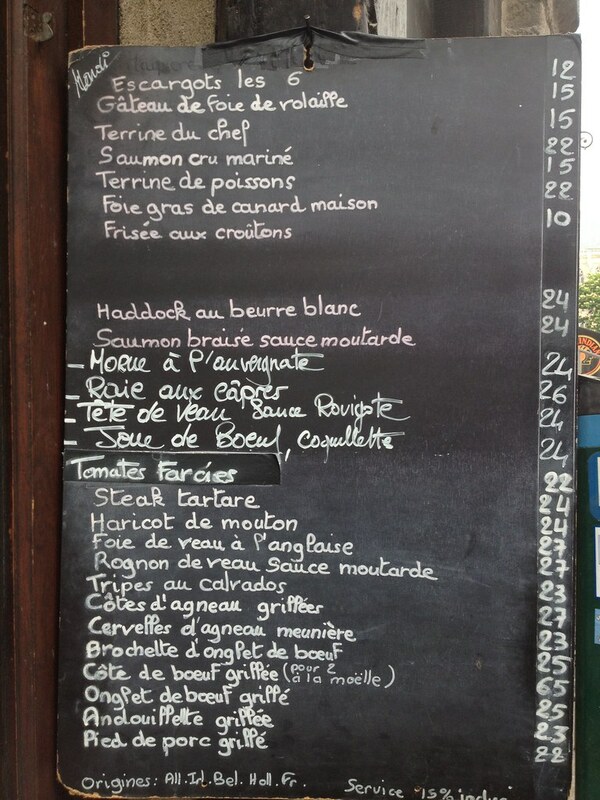 Has anybody tried the foie de veau? Reading this in print reminds me that I am in the paradoxical position of regarding French as the most beautiful language in the Western world (or perhaps ALL of the world), but not really knowing how to pronounce a great deal of it correctly. They don’t call it la belle langue française for nothing. À chacun son goût, I suppose, boss; tripe done right is magnifique, you ask me. Interesting about always the same order. I am always pulled in two directions that way when visiting a favourite restaurant. It is nice to have something good and familiar, for comfort. Yet it is also fun to try something new … often what I wind up doing is one of each! Care to pass them along? Ah, Les Halles… It was there where I got my first soupe à l’oignon, with croutons, at midnight. Then the Halles, magnificient steel structures, were still standing up, and it was there where all of Paris, including shops, restaurants and hotels, bought their vegetables and food early in the morning, every day. Most Parisians agree with the fact that breaking down The Halles (a few are left, but they covered a quarter mile) was the biggest mistake ever made by the Mairie de Paris. I am triggered. Please stop delicious food images. The Bourdain suicide hit me hard for some reason. There was a thread online a while back — coulda been right here on this site — where commenters were asked to name someone whose life they sometimes wish they had. I remember thinking “Bourdain.” The guy was smart, funny, hip, cool, curious, had excellent taste, was a damn fine prose stylists, and had magnanimity in him — all things I admire in others (and so often find wanting in myself). Goes to show, I guess, when it comes to other people, nobody really knows anything. I didn’t know this, who would have thought this…? Can I present you all to the Fosdyke Saga, the story the family of a tripe magnate (a strip cartoon from the seventies). Wiki describes it as “very popular, if often unintelligible to those outside of the mid-north-west of England”. So be warned. The writer, Bill Tidy, is also from my hometown (Birkenhead) and used to improvise cartoons on the TV in the seventies. Had us in kinks, as they say. Tripe was a staple of the Lancashire cotton mill-workers who could buy it ladled into jugs as fast food. Competed with the dreaded “fish n’chips” which is thought to have been brought to Lancashire from Iberia by Sephardic immigrants (as mentioned in Charles Dickens), in parallel with the development of Atlantic trawl fishing and which used the cotton seed oil for cooking the batter. Tripe is also very traditional (though disappearing) in Milan and Lombardy (I lived there for 25+ years): they eat it with tomatoes and beans and serve it up for the annual village fair. The English eat it coddled with milk and onions (sometimes adding sausage).